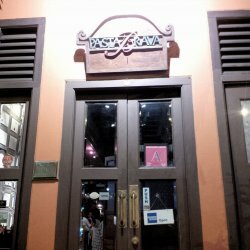 I am a big fan of pasta, and my friends recommend to this place - pasta brava as they serve really awesome pasta. 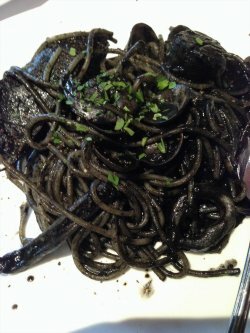 my friend recommend me to have squid ink pasta but it looks so black and unappetizing so i decided to go for carbonara (my all time favorite pasta dish). The carbonara here cost $22+ which i find it a little pricey. and also because of the price i was expecting it to be really delicious. however, it is just mediocre. 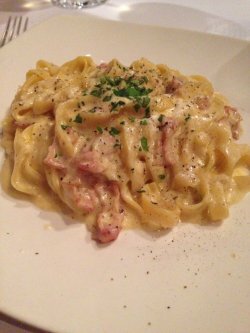 the creamy sauce is too thick to my liking and i could hardly finish my own serving of food. But i gotta say they are very generous with their bacons. a huge amount was given. The ambience of the restaurant is abit too vibrant to my liking. Service wise is alright too. staffs are quite attentive. Pasta Brava was extremely crowded for a weekday night. 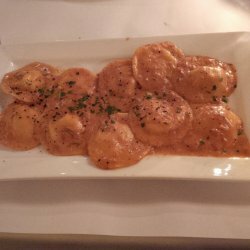 Reservations are strongly recommended if you are intending to have dinner at Pasta Brava. The Eggplant Parmagiana was heavenly. Deliciously fragrant, soft, and coated perfectly with the right amount of melted cheese. It went perfectly with the rocket leaves and was a fantastic starter. 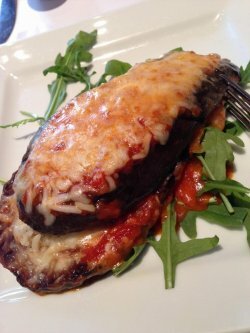 I've always liked Eggplant Parmagiana but this was definitely one of the better ones so far. The Vongole Spaghetti was done al dente, nice and springy, with a very generous amount of clams. The clams were fresh, juicy and so yummy. 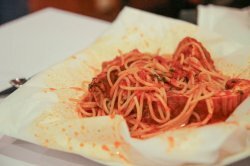 My only grouse was that the Vongole Spaghetti was, for some reason, served cold. It was not hot or warm, but really cooled. 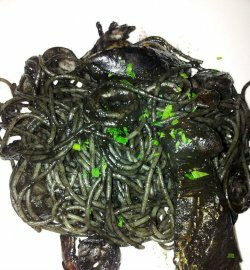 The Squid Ink Seafood Risotto might not look much since it seems all black and gooey in the lousy picture below but it was very good. The dish was served piping hot (yay!) 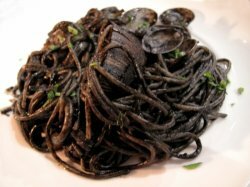 with thick squid ink, fresh juicy seafood, and well-cooked risotto. Will definitely return for the Squid Ink Seafood Risotto. Though very much an Italian Restaurant, Pasta Brava is adorned with Straits Chinese decorations and souvenirs, collected and kept by Rolando Luceri, a former Hotelier who has some 40 years of F&B experience, and his brother’s self-painted pieces of art. It can be quite a spot for a date, what with the bold yet elegant black and reds and the shiny glass wares on the table. However, it can, and it will get pretty noisy as the evening sets in. 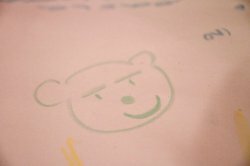 Besides being kept occupied with your usual bread basket, they also offer crayons here for some fun time with your friends / date. Since it’s an Italian Restaurant that shouts everything ‘Pasta’, I thought it apt to closely scrutinize them. 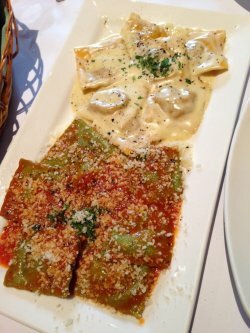 If you are looking for a perfectly al-dente pasta meal here, I’m sorry to say that you would be disappointed. It wasn’t consistently so, and parts of it were still sticky to the teeth. In terms of flavors though, I have no reservations to say that they’ve done well. 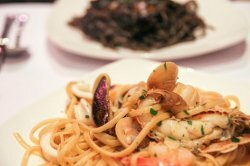 I especially like the Linguine with Prawns, Clams, Squid, Scallops and Crayfish ($23++). The seafood was well-cooked and well-flavored, no signs of them being overcooked. I had it change to white wine sauce; it could do with a little stronger hint of wine. Besides being able to choose your preferred type of pasta, you can also opt for a different sauce base: Pesto, Arrabbiata, Aglio Olio, Tomato & Basil, Bolognese, White Wine. 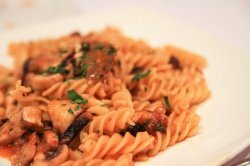 Pastas are all around the range of $20 – $23. 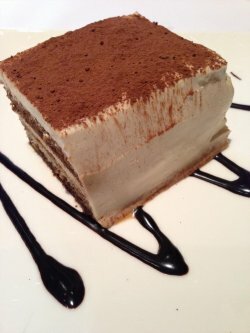 Tiramisu ($10++): If you are a Tiramisu fan, you will like this. 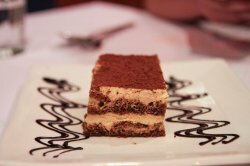 It is just about the strongest-flavored Tiramisu we’ve all had. But that’s the whole point isn’t it. It also has a very soft texture. 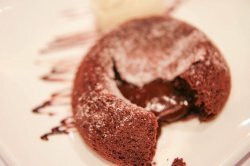 Chocolate Lava Cake with Vanilla Ice Cream ($12++): Chocolate Lava Cake at an established restaurant can almost always never go wrong. Rich, thick, flowy, warm, with slightly crisp borders of the cake. It’s worth every calories (not that I care, but just in case you do). 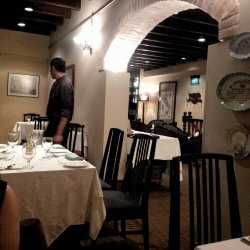 As a whole, I do think it’s quite alright and reasonable if you have the inclination to dine here for their pasta (and desserts – I love their desserts). What turned me off is their less than impressive service. When we were placing our orders, the waitperson was nowhere near friendly – they were merely doing their job, without a smile. It’s a common scene in these kind of restaurants – they were snobbish. Snobbish towards little Asian kids like ourselves, the minority in the restaurant. That’s not the way to go for a restaurant. And after we had completed our dessert, we were asked to adjourn to their upstairs bar if we would like to continue our conversation. You can have all the explanations in the world, but I have never, and will never be a fan of a restaurant that directly or indirectly, chases their customers away. So though their food is passable, I probably wouldn’t be back anytime soon. Complimentary Bread - Just your normal baguette with a touch of maize. Crisp on the outside but could have been softer and chewier on the inside. 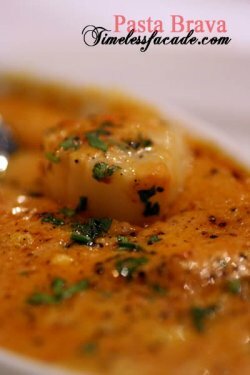 Capesante Alla Cardinale Gratinato (sautéed scallops, flavored with white wine, béchamel sauce, oven glazed) - As much as I'm a fan of scallops, this dish didn't really wow me. There was a consistency issue with the scallops. Some were done just right while others were undercooked or overcooked. And I didn't find them particularly sweet. I simply loved the béchamel sauce though. 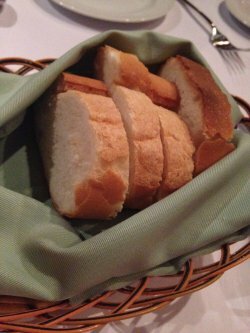 Creamy with a mildly burnt taste and just great as a dip for the complimentary bread. Stracci Ai Gamberie Capesante (thin pieces of fresh pasta with scallops, prawns, green peppercorn, white wine, with saffron cream sauce) - The pasta was rolled into nice flat strips that weren't too thick nor flimsy (reminded me of hor fun, just much firmer in texture) while the saffron cream sauce was rich yet didn't threaten to overwhelm. Portions of fresh scallops and prawns were generous which made this dish an excellent order. Tagliolini Con Aragosta (flat pasta with half lobster in tomato sauce) - The tagliolini was probably a little overcooked, coming across as a tad too soft. However, I appreciated its fragrance and the plentiful crunchy lobster cubes. The base was predominantly olive oil with squashed tomatoes so though oily, it wasn't heavy on the palate. Torta Di Mele Al Mascarpone E Ricotta Con Gelato (apple pie with mascarpone and ricotta, served with vanilla ice cream) - I thought that the apple pie was a very interesting piece of dessert, with the top layer tasting like light and cheesy lemon cheesecake. The middle layer comprised of apple cubes that were almost tasteless when eaten on its own. Wrapping up the bottom was a nice baked crust. There were raisins in the apple pie to give it a sweetness boost and a scoop of ice cream completed the dish. Panna Cotta All'Amaretto (italian version of cream caramel without egg, flavoured with amaretto) - Pasta Brava's pride and joy and the most interesting take on this ubiquitous Italian dessert that I've ever tried. On the outside it looked quivery yet firm but stick a spoonful into your mouth and feel it literally disintegrate (very little gelatin), very much like soya beancurd (豆花). Paired with the mildly sweet amaretto, it made for a nice soothing dessert. 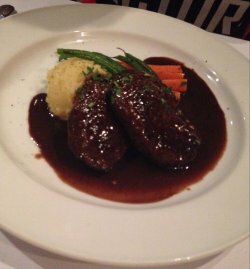 Food quality is comforting and so is the excellent service rendered by the friendly owner. 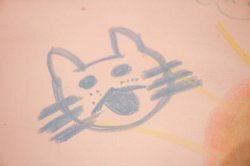 Doodling on the table with crayons is encouraged and that adds to the fun factor. Remember to make your reservations! We make a reservation for this popular restaurant 2 weeks before, since it was mostly fully booked even on weekdays. We had potato with leek soup and portobello mushrooms for appetisers that was really good and light to start the dinner. The seafood main dish was also packed with seafood greatness, with fresh crayfish, prawns and clams. It was served with garlic bread for dipping in the tomato based soup. 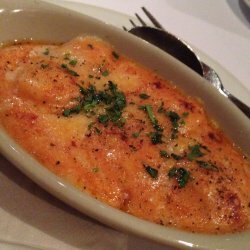 The risotto is one of the best I tried so far, it is creamy and rich in flavor. As it is rather filling, it is a great choice for sharing among the group. The food is excellent also! 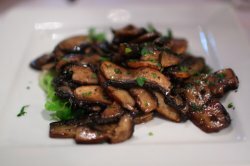 I had the sautéed portobello mushrooms as an appetizer. 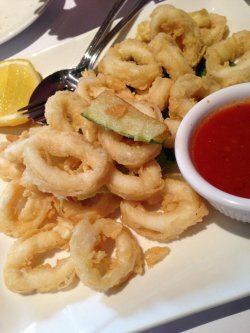 They were soft and tender, with a great flavour imparted from the garlic and parsley. 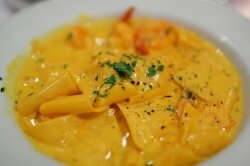 For my main, I had the home-made pasta, stracci with scallops and prawns in a saffron cream sauce. 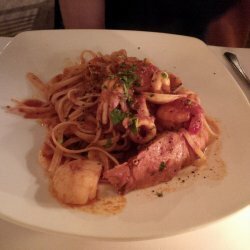 This was really great, the pasta was soft and tender, the sauce was creamy and rich, and the seafood was excellently fresh. All this made for one awesome pasta dish! 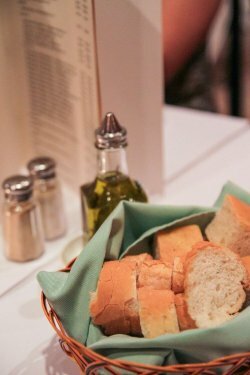 Pasta Brava’s specialty is dishing out traditional Italian fare that’s very rustic and hearty and to date, it’s still my favourite pasta restaurant in Singapore! 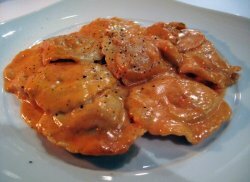 My darling pumpkin ravioli ($21++) paired with red capsicum sauce and cream that’s not cloying, even to the end. 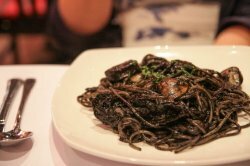 Slightly dry squid ink spaghetti ($23++) with loads of seafood. I was thrilled by my blackened teeth haha.